Look up in the sky: It’s a bird! It’s a plane! It’s a UFO! Nope, it’s just a cloud. But it’s a pretty unusual and spectacular one at that, and on first glance, it’s easy to see why the clouds — officially known as lenticular clouds — are causing such a fuss over parts of the Lone Star State in recent weeks. The circular clouds — their shapes and colors both haunting and beautiful — have been popping up following severe storms throughout Central Texas since mid-May, often coming from storms that dump a mass of cold air behind them. That’s because lenticular clouds are usually formed around mountains. Matthews explains that when stable air moves over a mountain, the cloud forms on the downward slope as the air condenses. It can happen in the absence of mountains, too, as is evident in Central Texas where peaks are a rare sight — storm systems and other patches of cool air can act like a mountain, allowing the atmosphere to have a similar effect on clouds and making conditions ripe for lenticulars to form. Some clouds can take on a disc-like shape, while others look similar to a funnel cloud. They can bring with them some atmospheric turbulence, which can be an issue for pilots, but they’re otherwise not harmful to people on the ground, Matthews said. That hasn’t stopped some Texans from reporting them: According to Fletcher Gray, a volunteer investigator with the Mutual UFO Network (MUFON), more than 50 reports of UFOs have been filed to the website since last month. 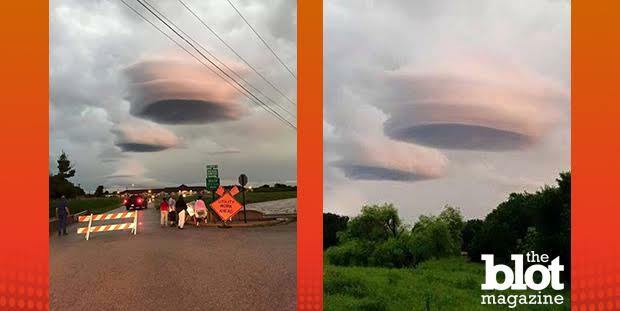 In a handful of cases, most of the reports were dismissed as lenticular clouds; others were obvious fakes (Gray told the Houston Chronicle that one reporter tried to pass a garbage can off as a UFO). “People think they’ve got something, but they don’t have anything,” he said. As the saying goes, the truth is out there — it’s just not in the clouds.